Everton FC are to restore the club's motto to their crest after its removal prompted outrage from thousands of fans. The motto Nil Satis Nisi Optimum, which means "nothing but the best is good enough", dates back 75 years but disappeared as part of a redesign. The club apologised in May after 22,000 fans signed an online petition condemning the "awful" 2013-2014 badge. Fans can vote on three new designs on the club website from Monday. Club communications director Alan Myers said: "There were clear messages that have come out from fans as to what they want. "The motto Nil Satis Nisi Optimum will be on the new crest because 95% to 96% of fans said they want it and that's what we wanted." 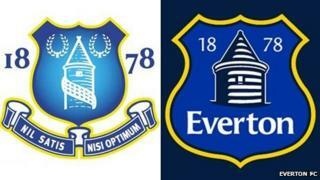 Everton consulted more than 200,000 fans and also players following criticism of the "embarrassing" new crest. The club said one fan travelled from Spain to Goodison Park to have his say about the redesign - even though he was advised an online form was available. The new crest ideas will be unveiled on Monday 23 September.